RAF Mepal Tom McGibbon "Mac"
Newbie posting so bear with me! 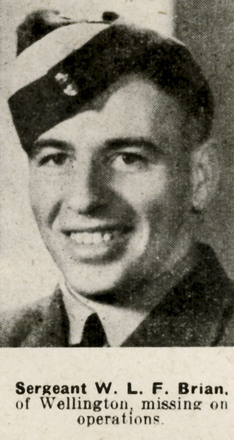 I had an Uncle Tom McGibbon "Mac" RAFVR 997826 1914-1994 who served in the RAF in WW2. I believe he was an aircraft ground crew engineer. 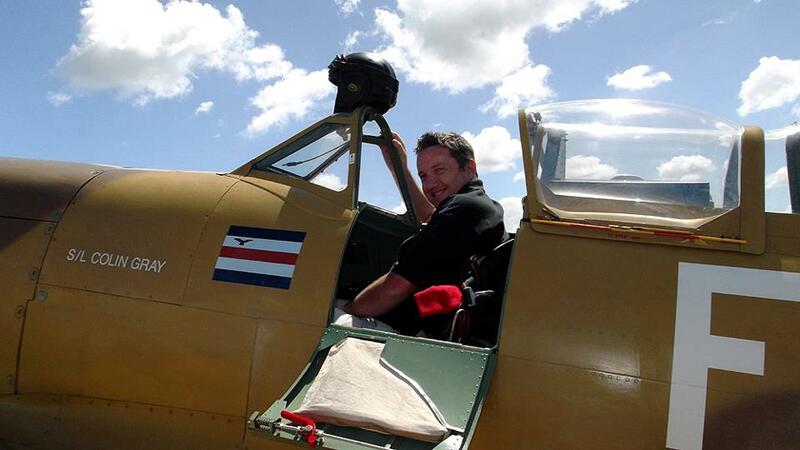 During some of that time he was with the 75 New Zealand squadron at Mepal. I have come across some photos from that time which may be of interest to your NZ WW2 aircraft enthusiasts, so I'm trying to find the right place to post these? They consist of an autographed souvenir menu from Chrismas 1944., not sure if the autographs are ground or flight crew? Also a few pics of planes and crews and himself along with his tags, the best one is of the plane "Paper Doll" , all the pictures were pretty small and faded so I have done my best on copying. There are also a few of himself and others at barrage balloons, relating to an earlier time. It's been a bit of a struggle getting through all the "security" to this site, so fingers crossed I have finally made it and you get to view the pics. Fabulous grouping Ronnie, thanks for sharing!! Fantastic collection there Ronnie. Thanks for posting and welcome to the forum!! Oddly I cannot find any of those names matching up to the No. 75 (NZ) Squadron roll, some match similar names but in different time periods, and some don't appear at all. Yet it's certainly indicative of No. 75 (NZ) Squadron as both the serial coades JN- and A- are mentioned. 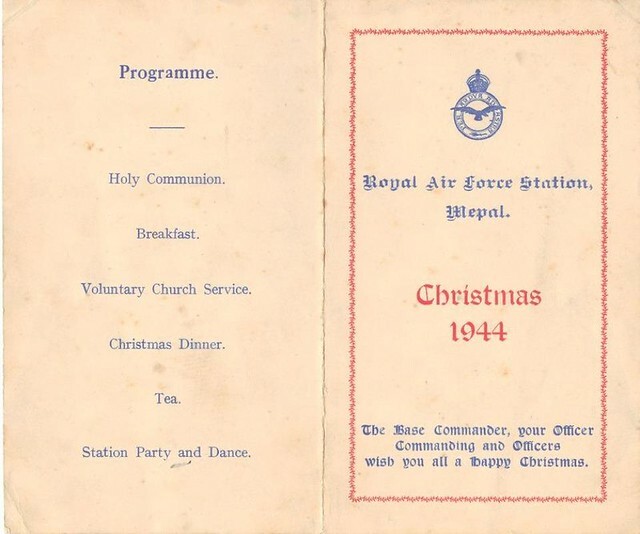 Definitely 75 (NZ) Sqdn - there is another copy of the Mepal Xmas 44 menu, slightly different, a copy owned by Colin Penfold, one of the signatures on this one. That's JN-O, "Dogsbody Again", and these are mostly "C" Flight groundies. "Snifter" was my uncle's kite, known by his crew as "Dog". The original Dogsbody was AA-D, as shown in a photo in "Bombs On Target". So "Paper Doll" was Mac's aircraft, and that's why he had photos of her. "Paper Doll" was HK563, JN-W; “Dogsbody Again” was NN747, JN-O, "Snifter" was HK601, JN-D (aka. "Dog"), “Bad Penny IV” was HK597, JN-P, “Zebra” probably HK554, JN-Z, “F-Fox” probably NG322, JN-F, and JN-V probably PB820. I wonder why most of the names are not on the squadron roll,and also wonder how many others are missing. The nominal roll has very few groundies listed, presumably because those records are harder to access? 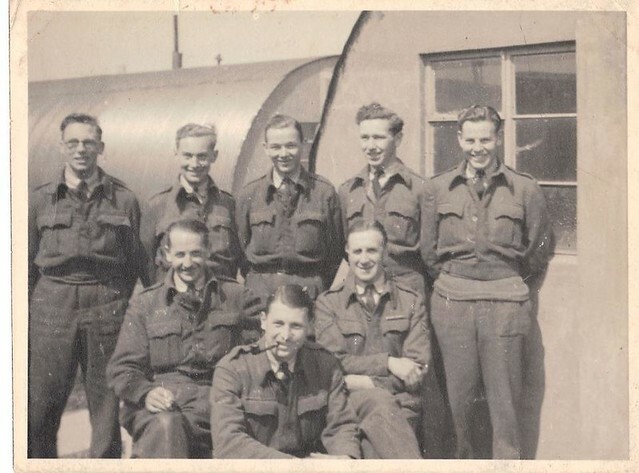 Mostly RAF bods, but there were quite a few Kiwis amongst them - it would a great project for someone to try and resurrect the names from photos, memoirs, etc. By the way, thanks Ronnie! Great photos, very valuable to us 75 (NZ) Sqdn fans. The Paper Doll photo is especially interesting to me, and I will try and find out who the crew were. There is a photo of S/L Nick Williamson in Paper Doll when she first arrived at the Squadron (June 44), with no op's marked and coded "S", and another taken much later (December) with the Hannan crew, when she was coded “W”, and showing 86 op’s marked. My uncle flew in her on 11/12 December 44, her 64th op'. This photo appears to show 70 op's marked, so this is probably P/O Donald J Williams RNZAF and his crew. Glad that I found the right place to post these photos and that you guys found them of interest. The photos and posting by Fwx has peaked my interest too! 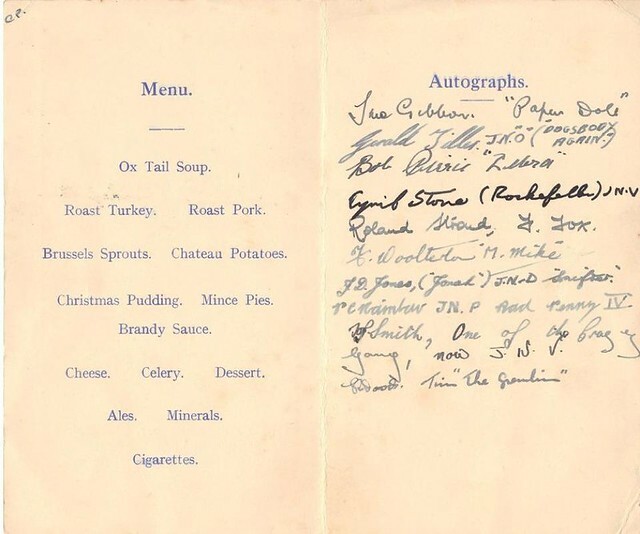 First the picture of the Colin Penfold's 1944 Menu. The signature on top of that menu is very likely to be my uncle Tom McGibbon's. I have added a photo of his signature from his driver licence and comparison photos on the photos link..what do you think? Can you tell me anything else about the others in it? Indeed any other info info about Tom that you can glean from these photos would be greatly appreciated. What was his grade/rank or responsibilities? How big was each ground crew? Were they responsible for the servicing of a specific A/C ? If the signatures are the same does that tie him to the Paper Doll A/C? New Zealanders among the non-flying personnel in RAF squadrons (and by implication Article XV squadrons, including 75(NZ) Sqdn), were comparatively rare, and at best might have numbered 5 to 7% of the total ground staff. 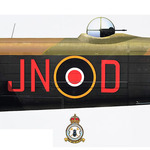 This was because New Zealand sent comparatively few technical personnel to serve on attachment to the RAF, and these numbered only a few hundred, most of whom were radio (radar) wireless, and armament personnel, along with about 40 instrument repairers. No airframe or aero engine types at all, they were too valuable to send overseas as the RNZAF needed every one they trained to build up the local RNZAF for maintaining (firstly) the training aircraft required to produce our aircrew for RAF service, or further training in Canada, and later, for local defence, then finally to build up the twenty-squadron Pacific air force from 1943 onwards, which in addition required transport squadrons which also had to be maintained. However there were a few New Zealanders who were already in the UK for various reasons when WW2 broke out, and during the war some enlisted in the RAFVR and were trained in various technical trades, including airframes and aero-engines and most of these transferred to the RNZAF in 1944, still in the UK. A few of these man possibly ended up with 75 Sqdn. Another detail to bear in mind is that heavy bomber Command squadrons "lost" practically ALL their groundstaff at beginning of August 1944, with 75 Squadron being no exception. All 75's groundstaff (with exception of their adjutant) were posted to No. 33 Base, which left the squadron with basically aircrew, plus the adjutant. However the "Base" personnel remained exactly where they were, doing exactly the same work on the same aircraft - however they were no longer members of No. 75. This type of organisation (mostly aircrew in the squadron, mostly technical and admin staff on station or base strength) would be very familiar to members of the RNZAF at various times during the history of the service. Again, thanks to all who have replied and apologies to for my own stupidity for not having read properly Chris's reply which had already answered my own questions!! I should also have made clear at the posts beginning that Tom was not a Kiwi but a Scot. The 75 squadron word press site that a number of you referred to has a HUGE amount of info on it, and I managed to "discover" another previously unseen photograph of Tom (unidentified in it) from the Alan Scott collection of the Anderson crew in 1945. I will add it to my own link. I have also unearthed in my own stuff another 75 squad crew photo with Tom in it. Again their identity and the date is unknown but the markings behind them might offer a clue to someone? Reads "EH?8" and maybe more hidden by a head again I will add it to my photos link. Its great that these photos are surfacing after so many years , I hope that there are more. Looks professionally posed so might be somewhere else in the archives. Anyone know anything about it? Now to figure how to get it onto this page. Aye Ronnie. That's a lovely clear photo Ronnie. I agree Dave a great shot. Charlie Shepherd served on 75 along with a few other Kiwi groundies and I have a group photo but not named. Sadly the ground crew on most squadrons were not recorded and up until a year or so ago 617 sq didn't accept them as association members because they couldn't produce a logbook that showed their posting. Yet if you talk to the aircrews they had utmost respect for these guys and many Kiwi crews took their groundies on their pub expeditions. It was even the same in the New Zealand bomber squadrons at home (the likes of the Baffins, Vincents, Hudsons, etc), in terms of so little was recorded as to the ground crew members of the squadrons. However they did stick together in reunions with the aircrews after the war, even despite them being separated into Servicing Units mid-WWII. t/o 2030 Newmarket, on mine laying duties in the Radish area (Kiel) of the Fehmarn-Belt. Hit by Kreigsmarine flak battery MAA508, and crashed 0023 in the Baltic, close to where the Hamer (BF467 AA-W) crew came down. Five are commemorated on the Runnynede Memorial, while both air gunners lie in Svino Churchyard. I imagine that the aircrew depicted is not the one lost when the aircraft was downed. Thanks Dave for getting me to figure how to get my photos up! Now when I figure out how to put the sound on , we will have that Stirling engine coughing,spluttering then bursting into life, throbbing and pulsing into a well tuned ROAR, straining like an eagle for the sky!